Frostburg business establishment for years. Owen was also Superintendent of the National Coal Company and the Barton-Georges Creek Valley Coal Company at Carlos. He lived at 45 West Main Street and died in 1893. ELISABETH HITCHINS, whose maiden name was Jeffries, was the wife of Owen. They were married in Wales and came to the United States in 1852. JAMES HANSON (1846-1920) was the son of Paytoe and Hannah Hanson, who came to this country from England. He worked in the coal mines and was a Mayor of Frostburg at one time. James married Francis Elizabeth Duggan, and they had eight children: Kate, Anna, William (W.D. ), Walter, James Henry (Harry), Cora (Hunter), Olive (Wilson), and Mildred (Williams). There were 15 grandchildren, one of whom was Mary E. Hanson, an active member at present. 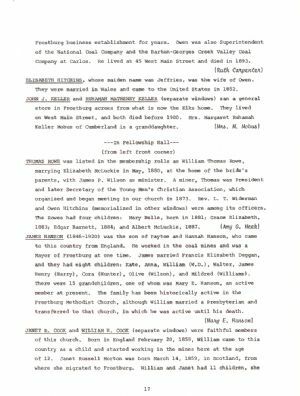 The family has been historically active in the Frostburg Methodist Church, although William married a Presbyterian and transferred to that church, in which he was active until his death.